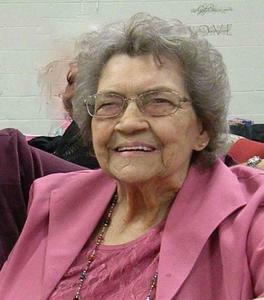 June Phillips, age 91, passed away Monday, August 14, 2017. She was born in Springfield, Missouri on January 31, 1926 to Sullivan & Rosa (Doyle) Norton. June had been employed at General Electric for 16 years until retiring. She enjoyed crocheting, playing cards, and spending time at the North Side Senior Center. She will be greatly missed. Children, Ardele Barnes, Jim (Janet) Phillips, Vicky (Lonnie) James, Tony Phillips, Jeffrey Phillips, Annette (Bruce) Bettilyon; 15 grandchildren; 27 great grandchildren; 15 great great grandchildren; life time companion, Jack Courtland; brother, Dale (Glorian) Norton; many nieces, nephews, cousins. She was preceded in death by her parents; son-in-law, Gary Barnes; brothers, Harry Norton, Bud Norton, John Norton & former husband, James Phillips. Sunday, August 20, 2017, 1:00 - ??? pm at VFW Post #7729, 6285 E. Apple Avenue. MEMORIAL: Great Lakes Hospice.